Whether your state administrators have asked you to tie teacher pay into student scores on standardized tests or they just want you to revamp the way you assess your instructional staff, chances are your district is well on its way to figuring out how to do it. The district chose Charlotte Danielson’s Framework for Teaching and then purchased Performance Matters’ FASTe (www.performancematters.com), which provides an integrated student assessment, data management, and teacher evaluation platform. FASTe (Formative Action System for Teacher Effectiveness) helps teachers improve by connecting them to differentiated resources and letting them continually access their evaluations. Thanks to Race to the Top funds, every administrator received an iPad loaded with descriptions of Danielson’s Framework. Administrators use their iPads for three types of observations: formal (long, pre-planned, and teacher conferences), informal (shorter and unplanned), and walkthroughs (5- to 10-minute daily or weekly “quick hits” to check in for smaller issues). Up north, the evaluation tool of choice for the state association of public charter schools in Michigan is Teachscape’s Reflect Video device. (www.teachscape.com). The Michigan Association of Public School Academies (MAPSA) used funding from the Teacher Incentive Fund. This five-year grant supports efforts to develop and implement performancebased teacher and principal compensation systems in high-need schools. MAPSA rolled out the program to 20 charter schools throughout Detroit. Teachscape Reflect is a low-profile, lightweight device that combines two highdefinition video cameras and two high-quality wireless microphones to provide a panoramic view of the classroom. 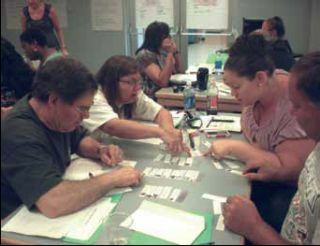 It helps instructors reflect on their teaching, share instructional practices, and receive just-in-time coaching based on the Danielson Framework. May recommends identifying point people in each building to be cheerleaders. He also suggests having a tech-savvy person present the first few times the product is used. “With any new technology, the biggest challenges occur when something doesn’t work the first time,” he says. The Virginia Beach City Public Schools is using TalentEd Perform in support of its new teacher evaluation system for the upcoming school year. The Web-based tool lets teachers and administrators collaborate and reflect online on goal setting. It also allows them to select formative and student growth measures, walkthroughs, observations, and evaluations. Administrators can schedule or assign tasks and analyze school-wide data and reports. One of the reasons TalentEd Perform was a good fit for the district is the amount of online discussion the product generates. “Both parties submit feedback until the principal finalizes the document,” says Enzmann. As a result of the new evaluation process, professional learning has become individualized. “Each teacher decides what their goals are and has a number of learning options built into their evaluations,” says Smith. For districts looking to create quick classroom observations that inform the overall evaluation process, the observe4success (www.observe4success.com) collaborative evaluation software is a suitable option. Administrators at the Derrick Thomas Academy in Missouri are currently using this program for their evaluations. “I can do a lot more observations, give very specific feedback, and hold myself accountable,” says Shane Knight, principal. When he and his assistant principal decided to observe each class once a week for the first three weeks of the 2011-12 school year, they used observe4success and it helped them discover that only four percent of their teachers were stating each lesson’s objective. They discussed it at a staff meeting and in two weeks, the percentage rose to 75 percent. “It’s a really powerful tool,” says Knight. Looking for a quick way to get feedback on school leaders? You might want to try surveys, which is what they do at Newport-Mesa USD in California. “We started doing ‘climate’ surveys at the end of each year,” says Jenith Mishne, director of education technology. K12 Insight (www.k12insight.com) handles the technical end of the surveys, and people can respond online, via text, or over the phone. “We ask parents and community members about how our schools are doing and how the principals are performing,” says Mishne. “We’re all about transparency.” Administrators use the data to discuss issues and, when necessary, make changes. 1 Define the construct: What is an effective educator? 2 Deploy multiple indicators: What evidence characterizes good teaching and school leadership? 3 Develop a clear composite rating: What weight should each indicator have and who should be involved in the decision? 4 Clarify differentiated performance levels: What distinguishes varying levels of educator effectiveness? 5 Build strong data analysis and reporting tools: What does the information reveal about the student, the educator, and the school’s performance? 6 Improve instructional and leadership practice: How can the information target professional development to boost educator practice, student learning outcomes, and school efficacy? 1 Use an intuitive and role-based platform: To gain teacher and administrator buy-in, the information captured needs to be high quality and user friendly. All data must be timely and accurate. 2 Create comprehensive and easy-to-understand reports: The platform should provide a variety of focused reports organized by data source or performance measure in the multiple indicators system. Having drill-down functionality makes it easy to disaggregate data by district, building, teacher or principal, and indicator. 3 Connect the evaluation program with professional development: Educator evaluation reports should be directly aligned to a comprehensive library of professional development resources that can be assigned automatically, based on performance, or recommended by an evaluator. Challenge: For the last year, Florida districts have been working to revamp their teacher evaluation systems. Solution: Earlier this year, 22 of the state’s 67 districts adopted FASTe, the Formative Action System for Teacher Effectiveness from Performance Matters. “We needed a tool to match the state’s new standards for teacher effectiveness and we wanted one integrated tool to serve our needs across the district. FASTe offered us a tool to measure teacher effectiveness, connect that data with our student data, and provide differentiated resources to support our teachers and extend their abilities,” says Patrick Simon, director of research and accountability for Citrus County School District. Challenge: New York state law requires teacher evaluations to be based on multiple measures of demonstrated effectiveness. Solution: The New York State Education Department chose Pearson to provide an approved rubric for the state’s annual professional performance reviews for teacher evaluation. Pearson’s new, approved rubric will be used to evaluate teacher performance in support of this goal. Challenge: Earlier this year, Oklahoma’s Tulsa Public School districts needed to find an online framework for its newly developed teacherevaluation system. The district wanted a solution that would translate its framework to an online interface that administrators and principals could easily manage. Solution: Tulsa chose TalentEd Perform, a cloud-based K-12 evaluation software package from Netchemia, LLC. TalentEd Perform lets districts evaluate everyone—including teachers, principals, and staffers—all in one place, on one system. Challenge: The Illinois State Board of Education wanted to provide an online system to train and assess all teacher evaluators. It’s all part of the effort to meet the requirements for the state’s Performance Evaluation Reform Act. Solution: More than 7,000 Illinois teacher evaluators will be trained and certified using Teachscape’s Framework for Teaching Proficiency System. The Consortium for Educational Change will provide additional training by creating online modules and inperson sessions. Challenge: School districts in Tennessee needed to find a better way to manage the increasing requirements for Race to the Top funding. Solution: One thing that the members on the state education board decided to do was implement a classroom observation rubric as part of the new statewide teacher evaluation system. They chose the TOWER (Teacher Observation, Walkthrough, Evaluation, and Reporting) system and TOWER Mobile from Randa Solutions. TOWER Mobile lets evaluators use the rubric on their iPads.